In my last two posts I reflected on two visits to fictional churches. 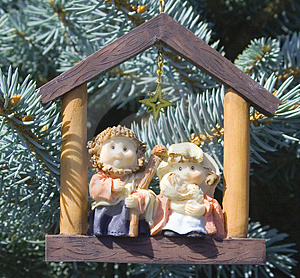 Tomorrow is Christmas, the celebration of God’s visit to earth. Of course, it was more than a simple visit; it was God’s full embrace of human life. Still, the reception he received was cool at best. There was no room at the inn, but the shepherds raced to greet him. Magi came from distant lands to honor his birth, but his own King Herod tried to kill him. Jesus’ birth created controversy. Even today people respond in a variety of ways to the concept of God becoming flesh. Some see it as a nice story that instructs us to see all births as sacred. Others see it as a dangerous myth that confuses vulnerable minds with wild tales that have no scientific, rational basis. While others simple choose to ignore it, their lives having no room for God. But many of us see it as the turning point in human history. God’s invasion to take back creation from sin, satan and death. God’s wild, mysterious gamble that humanity could be restored to its wonderous place in creation. I rejoice in that gamble, and fully believe it paid off for all of us. God’s visit has transformed us into God’s residence. Thanks be to God! This entry was posted in Uncategorized on December 24, 2010 by Pastor John Keller.